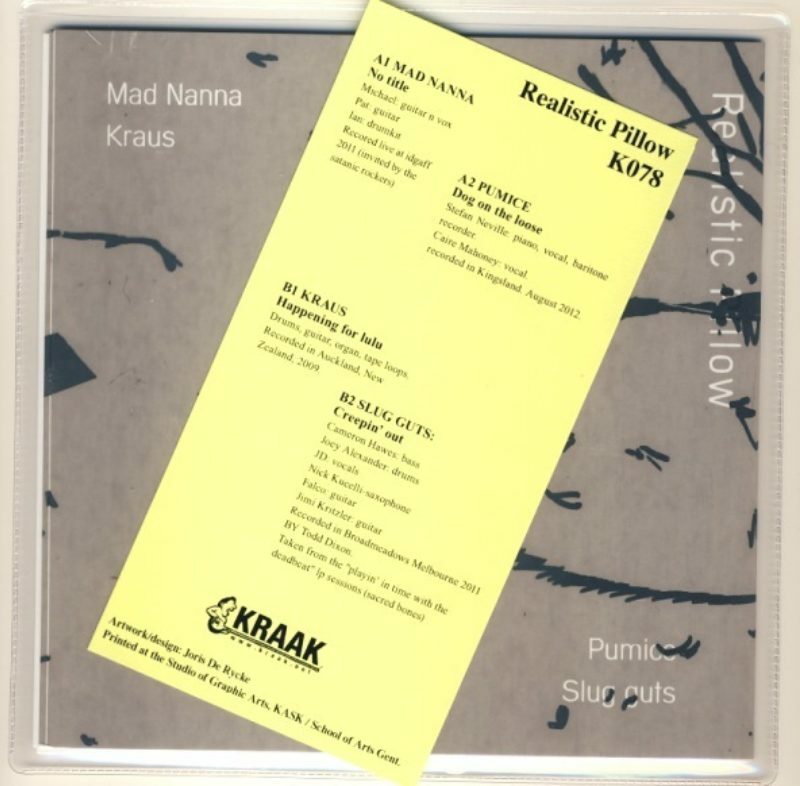 KRAAK | Various Realistic Pillow"
Fifth release in our ongoing 4-or-more-way split 7" series focusses on caviar from Oceania. Mad Nanna are a five piece band from Melbourne. They sound as a brilliant pop band lacking any ambition and sporting the wrong drug addiction. Melodies pop up by accident and recording ethics are low. Nineties lo-fi tape culture hasn’t felt so contemporary since. ‘Untitled’ feels like the perfect soundtrack to crying yourself to sleep on a sunday afternoon, digesting your third romantic comedy of the day. Another tear jerker is ‘Glordinary’, a mesmerizing piano ballad by Stefan Neville’s Pumice. Neville is probably one of the most consistent artists from New Zealand and doesn’t stop delivering since 1994. This song is melancholic and grubby and beautiful. It’s a romantic bullet in duet with Claire Mahoney. Just as you are about to drown yourself in an everlasting tristesse, Kraus wakes you up on the B-side with a repetitive fun fair shout-along, or a Zimbabwean football anthem with a two note lead that sticks in your head for weeks. Brainburner party style. Slug Guts finish off with the odd one out here. Often seen as Brisbane’s update of Midnight Oil it is hard to avoid the reference when you hear ‘Creepin’ Out’. With its throbbing rhythm, scorching guitars, heavy pathos in the vocals and general misanthropic vibe, this track will leave you completely broken and trackless for the days to come.